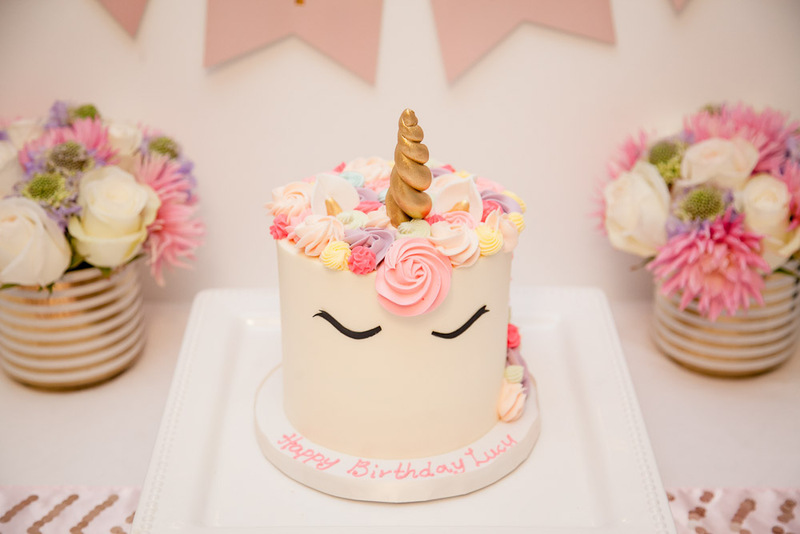 Lucy requested a Unicorn party, with a unicorn flavoured cake, and real live unicorns!! After a discussion about mythical creatures vs. real animals, and a little internet search for animals and kid's birthday parties, we settled on unicorn invites, a unicorn shape cake, and a visit from some adorable animals care of Pawsitively Pets. Luckily since we wanted to have a weeknight birthday party they were able to accommodate my less than 2 week notice (see I'm not always organized). Please note: weekend parties book up much farther in advance, so don't wait as long as I did, or you'll be disappointed. Once I knew Lucy wanted a Unicorn party I set to work on the internet to find a perfect invite and some cute decor. I fell in love with this invite from Little Crazy Doughnut on Etsy, and knew Lucy would adore it too. I absolutely love buying custom invites like this because it's so convenient, affordable, and fast. Which was especially important on my tight timeline. We sent our invites out via email which is a time and money saver, and has the added benefit of preventing kids from getting their feelings hurt at school. I firmly believe that you can invite as many or as few kids to a birthday party, as long as your tactful about it. A full class party of 28 kids was not happening for us, so Lucy chose a few of her friends from her class and our neighbourhood to invite. Next I set out to find a unicorn cake and when I saw this one by Le Dolci I knew it was perfect. I wanted this to be a huge surprise for Lucy, so I never let her see photos of it ahead of time. She was absolutely blown away by it, and so were all of the guests at the party. Plus it was absolutely delicious! As a baker I'm especially picky of icing and this was some amazing icing. The beautiful flowers from Tonic Blooms added such a perfect touch to the table, and brightened up our home all week. I didn't know exactly what I wanted, so I sent them a photo of some of the party decor and they made up these gorgeous arrangements. I was blown away by how well they complimented the overall theme. I absolutely love the way the decor all turned out, but nothing at the party could compare to the adorable creatures Pawsitively Pets brought. Our host Jess arrived a few minutes early and set up the area for the pet show. I loved how they came so prepared with sheets to cover the floors, baby wipes and hand sanitizer. Jess was great with the kids and managed to keep them engaged throughout the whole hour. When some of the kids started getting tired of sitting, she did a little exercise break with them and got them right back into the show. 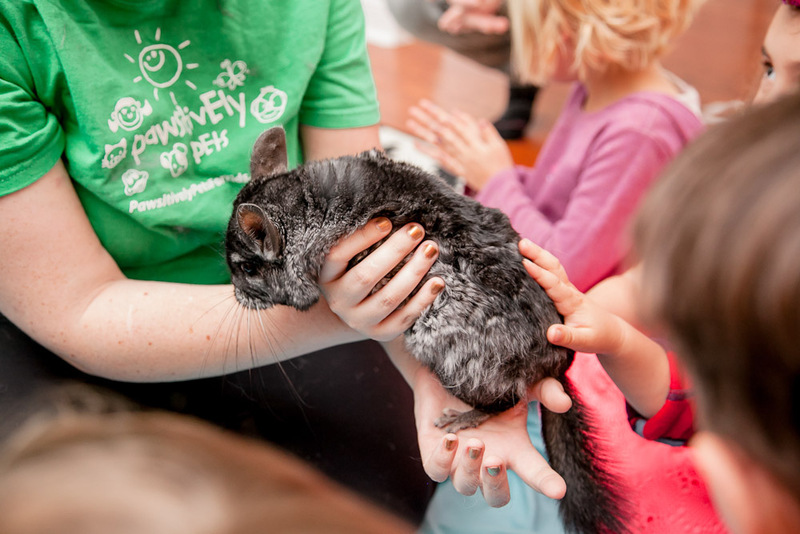 The kids got to look at, learn about, touch and hold a bunch of different cool animals. The questions that the kid's asked were so adorable, and it was amazing to hear some of the stuff they already knew about the animals. The chinchilla was the highlight of the party for me. Not only the softest thing I have ever felt (seriously it's softer than cashmere. no joke. I want one), but it also sat on their heads, which basically made their year. I'm so happy to have so many amazing memories from Lucy's party captured by Silvia and Tony of Anchor Studio. I know I would never have been able to get action shots like this while hosting. Although we won't be able to have a photographer at every party, it was a nice treat for this one. I don't think Lucy is going to forget this party anytime soon. She is still wearing her unicorn horn around the house...and sometimes to school. So all in all I would say it was a major success. I will be sure to share the DIY Unicorn horns on the blog soon. I hope this gives you some inspiration for your next kid's birthday party.